“Hmmm, Majora has no concern for it’s own well-being and was going to entirely destroy the world… for no reason. That’s scary, and feels so far from human or logic, there was no reasoning with it, no understanding it. While all the villains were definitely going to go through with their evil plans, there’s just something about Majora that seems unstoppable when you first look up at that moon baring down on Clocktown. To throw in my own opinion about our well-known antagonists in the series, I would have to agree with the consensus and say that Majora is the most effective villain in the series. Majora seemed to give that sense of a terrifying presence that no other antagonist in the series could accomplish. It was a horrid creature with no regard for anybody or anything, and hungered only for bloodshed and the destruction of the world as we know it. It was a ruthless demon imprisoned inside of a mask that fought brutally with the intent of total annihilation. Majora has to be the best antagonist for me, hands down. It seems that most other people seem to think so, as well. 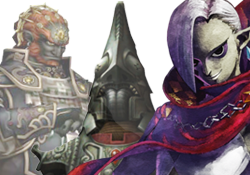 There have been many intimidating villains over the course of the Zelda series, which one seemed to do the job for you? Which evil being struck terror into your heart and made you feel like he wasn’t messing around, and that he would stop at no length to crush you and the pitiful world you are trying to fend his dark influence away from? Register on our forums and pop into the thread to post your opinions.